Much has been made of the Palestinian exodus of 1948. Yet during their decades of dispersal, the Palestinians have experienced no less traumatic ordeals at the hands of their Arab brothers. As early as the mid-1950s, Iraq, Saudi Arabia, and Libya expelled striking Palestinian workers. In 1970, Jordan expelled some 20,000 Palestinians and demolished their camps; in 1994-95, Libya expelled tens of thousands of long-term Palestinian residents in response to the Oslo process; and after the 2003 Iraq war, some 21,000 Palestinians fled the country in response to a systematic terror and persecution campaign. As recently as 2007, Beirut effectively displaced 31,400 Palestinian refugees when the Lebanese army destroyed the Nahr el Bared refugee camp during fighting between the militant Fatal al-Islam group and the Lebanese army. 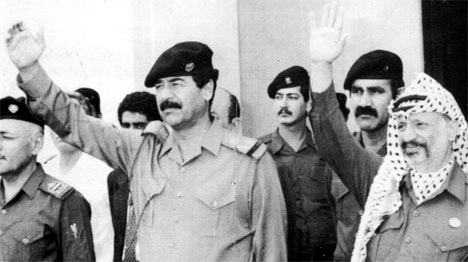 The expulsion of Kuwait's Palestinians was precipitated by the endorsement of Iraq's brutal occupation of the emirate (August 1990-February 1991) by Yasser Arafat (right, here with Saddam Hussein, hands raised). Whether true or not, Palestinians were viewed by Kuwait's rulers as "fifth columnists" and forced to leave their decades-old homes. But the largest forced displacement of Palestinians from an Arab state took place in 1991 when Kuwait expelled most of its Palestinian residents in retaliation for the Palestine Liberation Organization's (PLO) endorsement of Iraq's brutal occupation of the emirate (August 1990-February 1991). It mattered little that this population, most of which had resided in Kuwait for decades, was not supportive of the PLO's reckless move: From March to September 1991, about 200,000 Palestinians were expelled from the emirate in a systematic campaign of terror, violence, and economic pressure while another 200,000 who fled during the Iraqi occupation were denied return. By September 1991, Kuwait's Palestinian community had dwindled to some 20,000. Yet while this expulsion was near the order of magnitude of the Palestinian 1948 flight (estimated by the Israeli government at 550,000-600,000 and by the Arab League at 700,000), driving PLO chairman Yasser Arafat to declare that "what Kuwait did to the Palestinian people is worse than what has been done by Israel to Palestinians in the occupied territories," it was largely ignored by the international community with neither the U.N. Security Council nor the General Assembly doing anything to assist the newly displaced refugees and punish their ethnic cleanser. The first Palestinian Arab immigrants to Kuwait arrived in 1936 at the invitation of its ruler, Sheikh Ahmad al-Jaber al-Sabah, and the positive impression they made inclined Kuwait to accept further workers, including many displaced by the 1948 war. Between 1948 and 1960, tens of thousands of refugee and non-refugee Palestinians from the West Bank and Gaza arrived in Kuwait while the sheikhdom was still a British protectorate. Many were teachers, civil servants, and unskilled workers. By June 1961, when Kuwait declared its independence, its Palestinian community had grown to some 40,000, about 12 percent of the emirate's entire population of 321,621. Palestinian immigration accelerated after 1959 when Kuwait signed an agreement with Jordan cancelling visa requirements for Jordanian citizens. Many Jordanian Palestinians, from both the East and West Banks, seized the opportunity, bringing relatives and friends into Kuwait. In ten years, the Palestinian population of the emirate quadrupled. By August 2, 1990, the day Saddam Hussein invaded Kuwait, the population had multiplied to 400,000-450,000, or four Palestinians for every five native Kuwaitis. It was the Palestinians more than any other single expatriate group who helped shape the country's social, economic, and political development. The length of their residence, the size of the community, their dedication to work in both the public and private sectors, and their consequent entrenchment in the bureaucracy, economy, professions, and the media enabled the Palestinians in Kuwait to develop into one of the most cohesive and active communities in the diaspora. [In 1962] Sheikh Sabah Al-Salem, then foreign minister and later the emir, said that Palestinians deserved to be well treated because of their skills and hard work. "Look at them. Among them is the best surgeon, the best doctor, and the best administrator." ... In recognition for their sincere services, about two thousand of the Palestinian pioneers were granted the [sic] Kuwaiti citizenship ... The 1967 war convinced Palestinians that their stay ... was becoming permanent. Their behavior started to change from using practical tactics for temporary stay to adopting strategies that aimed at permanent residence there. This meant that after getting jobs, Palestinian employees would get married or bring families, rent homes or apartments, and spend most of their income wherever they lived. That all changed dramatically with Saddam Hussein's invasion of the gulf principality. Iraq's occupation of its "nineteenth province" (i.e., Kuwait) lasted approximately seven months. But even before the invaders were driven out, a deliberate decision to expel the Palestinians had been taken at the highest levels of the Kuwaiti government. In a February 21, 1991 interview with The Independent, Sheikh Saad al-Abdullah al-Sabah, Kuwait's crown prince, still in exile, called for "cleansing" Kuwait of "fifth columnists." By March 13, The Guardian cited government officials expressing the need to "clean out" the Palestinian neighborhoods, and in a speech on April 8, the emir himself urged Kuwaitis to continue the campaign of "cleansing" Kuwait of the alleged "fifth columnists." On July 9, Kuwait's prosecutor general Hamed Othman told USA Today, "Every country has the right to deport people it considers a security risk. You do it in Britain and America also." Sabah expressed bitterness at the behavior of Palestine Liberation Organization chairman Yasser Arafat, who embraced Iraqi president Saddam Hussein after Iraq's invasion of Kuwait last August, and at Palestinians generally who he said "helped destroy" Kuwait by collaborating with the Iraqis. Before the invasion, he said, there were 380,000 Palestinians in Kuwait ... Now, he said, thousands who do not have jobs will be deported or their permits will not be renewed. … "And I think we have a perfect right to demand" it, he said. "It's not just us in the government demanding it, it's the people in the street who are demanding it." … Having a large number of Palestinians in Kuwait would not be "helpful to our security," he added. The deportations decimated the Palestinian population in Kuwait from 400,000-450,000 to 10,000-22,000. "The former Palestinian neighborhoods in Kuwait now lie empty of residents," reported The Guardian. "There are plans to turn the Palestinian suburb of Hawali into an amusement park. Many of these Palestinians had lived in Kuwait for decades, and generations of their children were born there. Palestinian school teachers, doctors, nurses, administrators, financiers, accountants, engineers, and university professors who helped to build Kuwait, were forcibly uprooted and expelled." Many of the deportees were subjected to abuse or worse during the process of expulsion. In March 1991, the Associated Press quoted a grave digger at the Riqqa Cemetery in Kuwait, talking about mass graves: "They were all Palestinians … One man had a severed head." The agency later reported that even some members of Kuwait's ruling family were involved in the killings of Palestinians, and Kuwaiti pro-democracy activists claimed the royal family had formed private "death squads" to execute people suspected of collaborating with the Iraqis. The director of the Palestine Human Rights and Information Center reported interviews with four Palestinian men who escaped Kuwait after being imprisoned there, saying that they were beaten with metal rods, burned with cigarettes, and interrogated by Kuwaiti officials during their imprisonment in Kuwait City. Palestinian children were expelled from public schools while heavy financial burdens, such as new health fees, were placed on Palestinians who wished to remain. According to the Palestinian group Badil, "About 4,000 people were killed, and 16,000 tortured in Kuwaiti detention and interrogation centers. Most of these were Palestinians." Roughly half of Kuwait's prewar Palestinian population of 350,000 fled the country during the Iraqi occupation … Those who remain in Kuwait are being subjected to a range of pressures seemingly designed to drive them out of the country. Most Palestinians have not been allowed to resume their jobs. Many have been unable to obtain new Kuwaiti license plates for their cars … Garbage has not been picked up since liberation in such Palestinian communities as Hawali, in contrast to Kuwaiti neighborhoods. Harassment at the ubiquitous checkpoints is commonplace. The combined effect of these actions and the terror unleashed by the official violence is a resignation on the part of large numbers of Palestinians that they will have to leave what for many is the only country they have ever known. But even flight is impeded by the Kuwaiti government's refusal so far to release the one month's salary per year of service which all workers accumulate as a form of pension although the government finally pledged last week that these funds would be made available. Approximately 180,000-200,000 Palestinians who had fled Kuwait during the Iraqi occupation were not permitted to return. According to an account by Palestinian academic Shafeeq Ghabra, by December 1991, Kuwait's Palestinian population had dwindled from a pre-invasion strength of 350,000 to approximately 150,000. Middle East Watch, a project of Human Rights Watch, reported that the Kuwaiti government had failed to appoint guardians to protect absentee property, and that in July 1991, the Kuwaiti cabinet approved regulations allowing Kuwaiti landlords to remove furniture and other items from rented premises previously occupied by foreigners who were not being allowed to return. The vast majority of the Gulf war returnees [to Jordan] are close to impoverishment ... Thus far only 25% of those Jordanians and Palestinians working in Kuwait have been able to get back their bank savings and pensions, or have received compensation. ... 91,550 applications for financial compensation have been made to the Geneva office of the [Compensation Commission] through the Jordanian Ministry of Labour … All in all, the claimants are asking for $3bn in restitution. ... A quick departure and the chaos of occupied Kuwait are frequently cited by applicants as reasons why their legal and business papers are not complete. But [the Jordanian official tasked with processing Palestinian claims] fears that the Compensation Commission in Geneva will throw out incomplete applications. In the end, the U.N. Compensation Commission processed 43,975 Palestinian claims, of which 35,878—or 82 percent—were rejected. Total compensation for property lost in Kuwait claimed by evicted Palestinians was $33 billion of which $149 million were finally awarded—a compensation rate of 4.4 percent. These expulsions violate several provisions of the Fourth Geneva Conventions … because Kuwait has expelled some who said they would face persecution ... and others who are refugees or stateless and should not be expelled. ... The International Committee of the Red Cross has explicitly upheld the view that Palestinians in post-liberation Kuwait are protected persons. ... According to Article 36 of the [Geneva] Convention, any repatriation must be carried out "in satisfactory conditions as regards safety, hygiene, sanitation and food." The dumping of deportees in the middle of a mine-infested desert ... hardly comports with this legal requirement. ... Kuwait is making no apparent effort to ensure that the long-term residents of Kuwait who are sent to Iraq will not face persecution. Until a third country is found, refugees are entitled to the protection of the Fourth Geneva Convention, including ensuring the provision by Kuwait of the means of subsistence, through paid employment or state allowances ... Kuwait has wholly ignored these legal requirements. Because they are stateless, there is international law that requires that at least people born within Kuwait be granted Kuwaiti citizenship, and the Kuwaiti government has simply refused to recognize that fact, to admit these people back home. In March, 1991, the International Committee of the Red Cross was able to begin visits to security detainees in Kuwait City. A number of prisons were not accessible to the Red Cross until months later. By early December, the agency had been given access to all places of detention but still had not been permitted to see all detainees. In early June, Kuwait began busing Iraqis, Palestinians and other foreigners from a jail in Kuwait City northward to the border with Iraq. Some of those being deported said they did not want to go. The Red Cross objected to the expulsions, saying that because it was not allowed to participate in the process, it could not determine whether the legal rights of the deportees were being respected. Most of the Palestinians who were living in Kuwait when it was invaded fell under the protection of the U.N. High Commissioner for Refugees (UNHCR) rather than the U.N. Relief and Works Agency for Palestine Refugees in the Near East (UNRWA). Under the 1951 Convention Relating to the Status of Refugees, Palestinian refugees residing in the West Bank, Gaza, Jordan, Lebanon, and Syria fell under the mandate of UNRWA, but most of the Palestinians in Kuwait were under the protection of UNHCR because they were outside UNRWA's five fields of operation authorized by the U.N. General Assembly. In cases where voluntary repatriation [of refugees] is not a viable option, finding a home in the country of asylum and integrating into the local community could offer a durable solution to their plight and the opportunity of starting a new life. … In many cases, acquiring the nationality of the country of asylum is the culmination of this process. UNHCR estimates that, during the past decade, 1.1 million refugees around the world became citizens in their country of asylum. But UNHCR confronted formidable obstacles. While 144 states are parties to the 1951 refugee convention, among Arab states, only Egypt and Yemen have signed it. Kuwait, a non-signatory neither adhered to the convention obligations nor had national asylum laws and procedures in place. Moreover, The New York Times reported that as late as July 1991, UNHCR had not been allowed to set up a permanent office in Kuwait City, preventing imminent deportees from obtaining refugee status that would allow them to get U.N. assistance in finding new homes in other countries. The United Nations High Commissioner for Refugees was also initially barred from opening an office in Kuwait, and the United Nations Relief and Works Agency… has not been allowed to operate. During the Iraqi occupation, the Kuwaiti government-in-exile solicited the help of international human rights organizations in monitoring violations committed by Iraqi forces in Kuwait. After liberation, the government encouraged these organizations to visit Kuwait to gain proof of Iraq's gross abuses. But when these organizations also condemned abuses then being committed by Kuwaiti forces, the Kuwaiti authorities restricted access to the country. For six weeks, in April and May, the Kuwaiti Embassy in Washington refused to issue visas to representatives from Middle East Watch and the U.S. Committee for Refugees. Thereafter, international human rights organizations obtained access to Kuwait without difficulty. Sadako N. Ogata, the U.N. high commissioner for refugees during this period, stated, "We had to move with caution, as the issue was delicate and required confidence building on all sides." But overall, UNHCR was able to do very little to prevent the uprooting of the Kuwaiti Palestinians. UNRWA, too, tried to intervene, also with little success. During a meeting of the agency's major donors in June 1991, its commissioner general, Ilter Turkmen, affirmed that UNRWA did have an obligation toward Palestinians who were being "persecuted, hounded, and expelled by the Kuwaiti government for supposed support of the Iraqi occupation … I consider that the responsibility of UNRWA extends to Palestinians in all parts of the Middle East [including Kuwait]." Despite UNRWA's supposedly restricted fields of operation, Lance Bartholomeusz, former chief of the agency's International Law Division, noted that "General Assembly resolutions do not explicitly exclude UNRWA from operating in other areas." During the spring and summer of 1991, a number of Palestinians … started to contact UNRWA headquarters… Commissioner-General Turkmen … traveled to Kuwait once or twice to discuss their plight with the Kuwaiti leadership and also extended his influence through contacts with the Arab League and other parties. ... The idea of a mission came up during the spring of 1992. The purpose of the mission was to carry out a rapid survey among the remaining Palestinians in the country, and especially those originally from Gaza, who had nowhere to return to, to find out the extent to which they had links with other countries and the extent to which they would be able to financially support themselves. The Agency followed with interest the situation of Palestinians who had gone to Kuwait from the Gaza Strip and who carried laissez-passers issued by the Government of Egypt. Those Palestinians, although allowed to remain in Kuwait, faced particular difficulties since most could not obtain work permits. They had no Israeli-recognized residency privileges which would allow them to return to Gaza; the Government of Egypt did not seem inclined to permit them to settle in that country; and few other countries were willing to accept them. Some Palestinians subsequently left Kuwait for those few third countries that would allow them entry. A few were able to obtain residency privileges in the Gaza Strip under an Israeli program that granted such privileges to Palestinians who invested at least US$100,000 in the local economy. By the end of the reporting period, approximately 25,000 Palestinians remained in Kuwait. Turkmen concluded by admitting that, like his counterparts at UNHCR, UNRWA was able to do little on behalf of Palestinians remaining in Kuwait. Most of the world was silent in the face of this enormous expulsion, including Kuwait's fellow members of the Arab League. A Palestinian observer lamented that, "You can call it deportation ... But I call it the third catastrophe after 1948 and 1967. Imagine what would happen if Israel deported 300,000 people. The whole world would be up in arms. But when an Arab deports or kills his Arab brother, it's all right; nothing happens." No resolutions were adopted by the U.N. Security Council or by the General Assembly. Not a word was heard from the Office of the U.N. High Commissioner for Refugees (UNHCR) or the Special Committee to Investigate Israeli Practices Affecting the Human Rights of the Palestinian People, or the Special Rapporteur of the Commission on Human Rights on the Situation of Human Rights in the Palestinian Territories Occupied Since 1967. All remained silent on the situation in Kuwait. The General Assembly-established Committee on the Exercise of the Inalienable Rights of the Palestinian People did record twenty-four statements on expulsions and deportations of Palestinians during 1990-91, but not one of these statements was about the 400,000 Palestinians deported by Kuwait. Instead, all twenty-four statements were angry protestations objecting to Israel's deportation of four convicted Palestinian terrorists with blood on their hands. Similarly, the massive U.N. Information System on the Question of Palestine (UNISPAL) contains over 30,000 text documents. But only three documents in this entire U.N. library concern the Kuwaiti expulsion. Two were complaints from the PLO concerning the mistreatment of Kuwaiti Palestinians and the third was a Kuwaiti denial of wrongdoing. Even the PLO was reluctant to fully confront Kuwait. Voice of Palestine Radio blamed the expulsions mostly on the United States: The internal "cause of the Kuwaiti campaign" against the Palestinians was Kuwait's regrettable "clannishness," but the real "decision to punish the Palestinians is a U.S., not a Kuwaiti, decision." The U.S. ambassador, Edward W. Gnehm, Jr., did urge Kuwait not to tolerate "hatred and prejudice" against the Palestinians "no matter how emotionally difficult it is. Kuwaitis must now champion justice and fairness for all people in Kuwait in the same way the entire world stood for those principles for Kuwaitis. To do otherwise will give Saddam Hussein a victory of evil proportions." But this was the only such statement from any official, and Washington did little beyond this. At that time of that visit, I heard stories of extra­judicial killings, of tortures and other ill treatment directed princi­pally toward the 180,000 Palestinians remaining in Kuwait. ...These people are subjected to arbitrary arrests, incommunicado detention, and forced confes­sions. They are denied access to medical attention, legal counsel and family members. They are tried before Martial Law Courts without adequate time or assistance to prepare a defense. Owens made this statement at a hearing on human rights and democracy in Kuwait, at which various human rights organizations were permitted to address the Kuwaiti abuses. But the hearing received no attention from the press and led to no follow-up activity by the George H.W. Bush administration. The U.N. Security Council did pass resolution 694 on May 24, 1991, condemning deportation of Palestinians, but the resolution was aimed at Israel for deporting the four Palestinian terrorists. Resolution 694 was one of eight separate U.N. Security Council resolutions devoted to condemning Israeli deportations, all of which ignored the fact that those deported by Israel were directly involved in terrorist acts. By contrast, the Security Council said nothing in 1991, nor at any other time, about Kuwait's deportation of a far larger number of Palestinians, most of whom had committed no crimes. But the height of hypocrisy was achieved by Kuwait itself. On December 22, 1992, just a year after it had expelled 400,000 innocent Palestinians, it had the temerity to send a Kuwaiti Students Union delegation to Lebanon to visit and express Kuwait's solidarity with the four Palestinians deported by Israel, boasting that Kuwait thus became the first Arab country to show its solidarity with the Palestinian refugees. Kuwait's ethnic cleansing of the Palestinians is notable not only because of its exponentially large scale but because it afforded the ultimate proof of the cynical Arab manipulation of the Palestinian cause. The Palestinian Kuwaiti community was arguably one of the most settled and economically integrated of Palestinian Arab diasporas, yet this did not prevent its uprooting in one fell swoop through no fault of its own. As such, the Kuwait expulsion constituted the greatest setback to the "reintegration of the refugees into the normal life of the Near East," presented by successive U.N. resolutions as a crucial step toward Arab-Israeli peace. See "Secondary Forced Displacement in Host Countries: An Overview," BADIL Refugee Survey 2008-2009, BADIL Resource Center for Palestinian Residency and Refugee Rights, Bethlehem, Summer-Autumn 2010. Efraim Karsh, "How Many Palestinian Arab Refugees Were There?" Israel Affairs, Apr. 2011. Daniel Pipes, "The Hell of Israel Is Better Than the Paradise of Arafat," Middle East Quarterly, Spring 2005, pp. 43-50. "Population of Kuwait," Kuwait Government Online, accessed July 10, 2012. Alex Takkenberg, The Status of Palestinian Refugees in International Law (Oxford: Oxford University Press, 1998), pp. 158-62. El-Najjar, "Palestinians in Kuwait: Terror and Ethnic Cleansing," chap. 10. Laurie Brand, Palestinians in the Arab World (New York: Columbia University Press 1991), p. 108. El-Najjar, "Palestinians in Kuwait: Terror and Ethnic Cleansing," chap. 10; Toufic Haddad, "Palestinian Forced Displacement from Kuwait: The Overdue Accounting," BADIL Resource Center for Palestinian Residency and Refugee Rights, Bethlehem, accessed July 3, 2012. The Washington Post, July 4, 1991. The Guardian (London), Sept. 12, 1992. Associated Press, Mar. 28, 1991. U.N. General Assembly (UNGA), A/45/1056 S/23033, Sept. 13, 1991. Haddad, "Palestinian Forced Displacement from Kuwait." "Human Rights and Democracy in Kuwait," testimony before the subcommittees on Europe and the Middle East and on Human Rights and International Organizations, Committee on Foreign Affairs, U.S. House of Representatives, Washington, D.C., June 11, 1991, pp. 12-5. Takkenberg, The Status of Palestinian Refugees in International Law, pp. 158-62. Shafeeq Ghabra, "The PLO in Kuwait," Middle East International, reprinted in Green Left Weekly (Melbourne, Aus. ), May 8, 1991. "A Victory Turned Sour: Human Rights in Kuwait since Liberation," Middle East Watch-Human Rights Watch, UNGA A/45/1056, S/23033, Sept. 13, 1991. Mariam Shahin, "Give us our due," The Middle East (London), May 1, 1993. Computed by the author from five U.N. Compensation Commission reports: S/AC.26/Dec.207 (2003) , S/AC.26/Dec.216 (2004) , S/AC.26/Dec.232 (2004), S/AC.26/Dec.239 (2005), and S/AC.26/Dec.247 (2005). "A Victory Turned Sour," Sept. 13, 1991; "Human Rights and Democracy in Kuwait," The Lawyers Committee for Human Rights, testimony before the subcommittees on Europe and the Middle East and on Human Rights and International Organizations, Committee on Foreign Affairs, U.S. House of Representatives, Washington, D.C., June 11, 1991, p. 78. "Human Rights and Democracy in Kuwait," p. 78.
 International Committee of the Red Cross, Information Dept., press statement 91/23, Mar. 24, 1991. Chris Gunness, UNRWA spokesman, "Exploding the myths: UNRWA, UNHCR and the Palestine refugees," interview, Ma'an News Agency, Jerusalem, June 27, 2011. "Accepted by a Generous Host," Office of the U.N. High Commissioner for Refugees (UNHCR), accessed July 3, 2012. Human Rights Watch World Report 1992 - Kuwait, Human Rights Watch, Washington, D.C., Jan. 1, 1992. Sadako N. Ogata, Turbulent Decade: Confronting the Refugee Crises of the 1990s (New York: W. W. Norton & Company, 2005), pp. 30-1. Takkenberg, The Status of Palestinian Refugees in International Law, pp. 300-1. Lance Bartholomeusz, "The Mandate of UNRWA at Sixty," Refugee Survey Quarterly, 2-3 (2009): 461. Author e-mail correspondence, Nov.-Dec. 2011. Report of the commissioner-general, UNRWA, July 1, 1992-June 30, 1993, UNGA A/48/13 (SUPP), Jan. 19, 1995, para. 21. Quoted in Donna E. Arzt, Refugees into Citizens: Palestinians and the End of the Arab-Israeli Conflict (Washington, D.C.: Council on Foreign Relations, 1997), p. 67. "The Question of Palestine: Expulsions and deportations," U.N. Committee on the Exercise of the Inalienable Rights of the Palestinian People, accessed July 3, 2012. UNGA Security Council, A/45/1027, S/22732, June 24, 1991. Voice of Palestine, Algiers, Aug. 30, 1991. Los Angles Times, June 10, 1991. "Human Rights and Democracy in Kuwait," p. 2. UNSC res. 694. The others were UNSC resolutions 607, 608, 636, 641, 681, 726, and 799. Arab Times (Kuwait City), Dec. 22, 1992. Related Topics: Kuwait, Palestinians | Steven J. Rosen | Fall 2012 MEQ receive the latest by email: subscribe to the free mef mailing list This text may be reposted or forwarded so long as it is presented as an integral whole with complete and accurate information provided about its author, date, place of publication, and original URL.